It’s time for the pep rally. 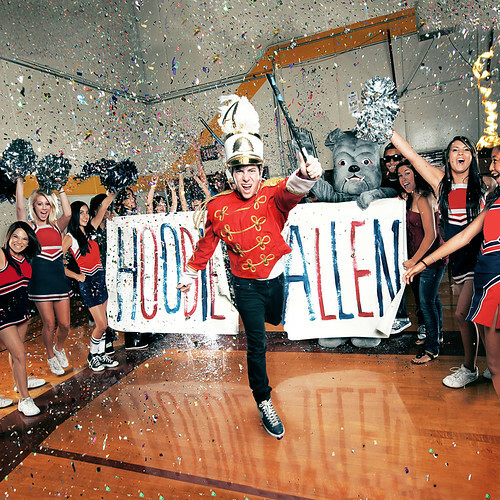 After enjoying internet success with “You Are Not A Robot” and “Words of Wisdom,” Hoodie Allen is back with Pep Rally. The 11-track mixtape features numerous samples from indie-rock artists including Marina and The Diamonds, Florence + The Machine, The Black Keys, Beach House, and VV Brown and more. Hoodie doesn’t have the best flow or delivery in the game but he is certainly one of the strongest unsigned lyricists out there and his beats are well put together. I encourage everyone to give the mixtape a listen. This entry was posted in New Music and tagged hoodie allen, Pep Rally. Bookmark the permalink.